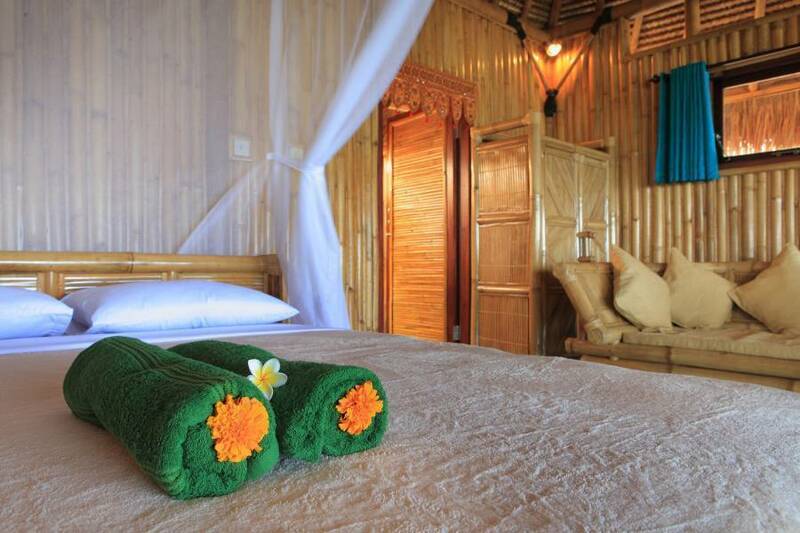 Our charming bungalows and spacious villas are made from local bamboo and use traditional construction techniques such as bamboo stilts and an alang alang roof (woven coconut leaves). 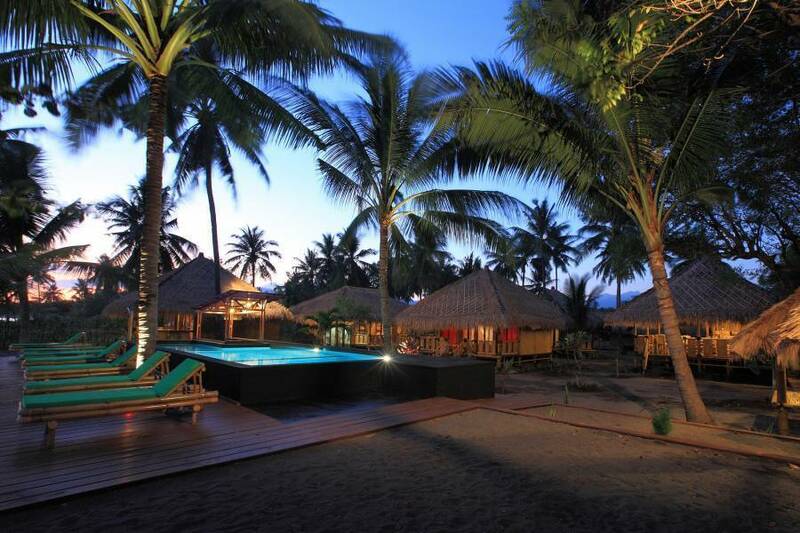 The restaurant, also constructed in bamboo, welcomes you on the oceanfront. The hospitality and friendliness of our team will make your stay with us unforgettable! We speak English, French and Indonesian. The resort has an exceptional location: Sitting on our beach you can watch as the sun slowly comes up, or take a stroll behind the resort and you can see the sun rise over the rice fields and look on as the local farmers start their day's work under the shadow of Mount Rinjani. In the evening lie on one of our comfortable bean bags and watch the sun go down with the nearby Gili Islands and Bali's Mount Agung in the background. Those who wish to relax, while curled up on your deck chair or beanbag, will have a tough decision to make: will you go swimming in the sea in front of you, take a dip in our basalt stone swimming pool or take a romantic walk on the beach while watching the sun go down? There is excellent snorkelling right in front of the resort and diving trips to the best spots around the Gili Islands can also be arranged for both new and already certified divers. For those looking for more adventure there is trekking and climbing of nearby Mt Rinjani or you can hire one of our bicycles and make your own adventure. Half day or full day trips can be arranged to waterfalls, traditional villages, local markets and the aptly named Monkey Forest. Golfers, you can play 18 holes at our neighboring course located only 3 km away. Located near Tanjung and the harbour at Bangsal, we can arrange transport from the new airport in Praya, a drive of around two hours. Day trips to the nearby Gili Islands can easily be accomplished. Massage on beach: Choose from Balinese, Thai, Rinjani Stone or Traditional Sasak massage, or one of the many body therapies available. We partner with one of the local village ladies who will come to the resort to give you the best massage in Lombok. 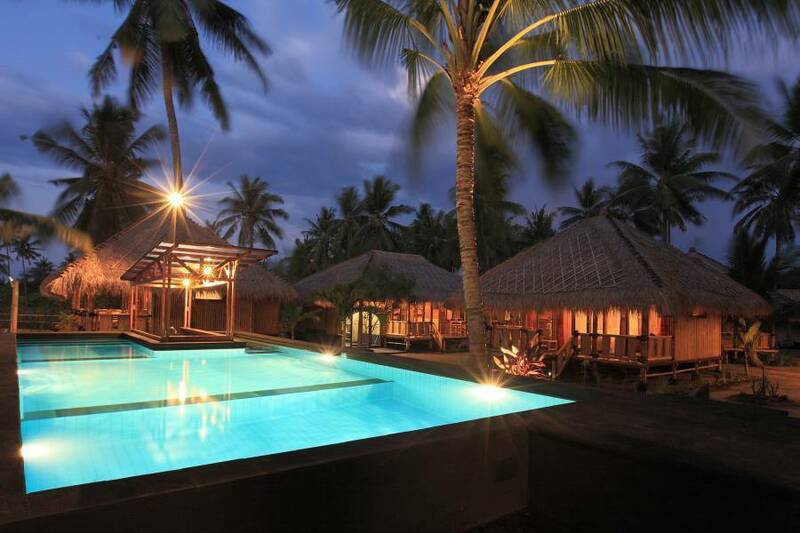 We are proud of our eco friendly features and have designed this resort so that is blends harmoniously with the landscape of the coconut trees and rice fields that surround it. We participate in a program that resettles turtles and coral in the marine environment in front the resort. Fresh water is pumped directly from our wells, and all wastewater (including sewerage) is treated on-site and recycled for use in our beautiful garden. All of the bamboo used in the construction of our resort has been treated naturally with seawater rather than chemicals. 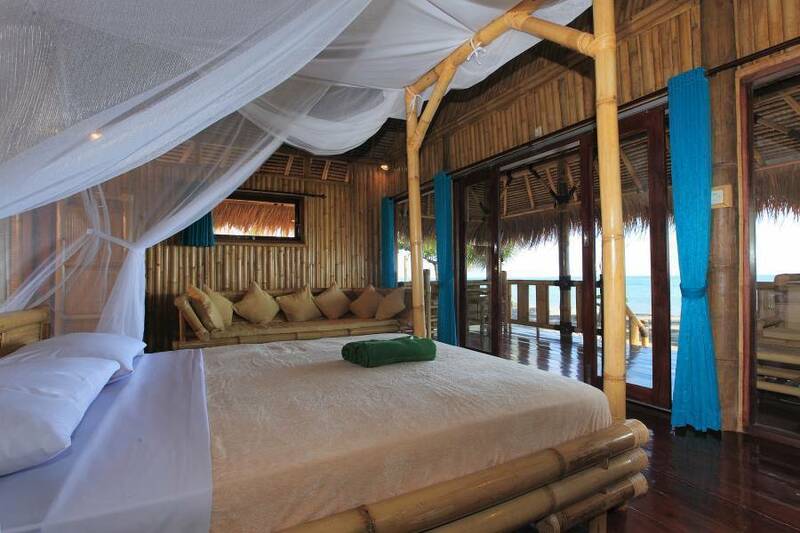 We do not have environmentally damaging airconditioning in our bungalows - we let the sea breeze cool us down. And all of our rubbish is subject to thorough sorting and recycling. We also encourage our guests to help us be environmentally aware - for example, by refusing plastic straws (which pose a huge risk to the environment, especially marine areas) and by not requiring that linens and towels be replaced every day (thereby saving water and electricity). Discover our Indonesian village, a haven of peace where you can wander along our volcanic sand beach for seemingly endless miles. 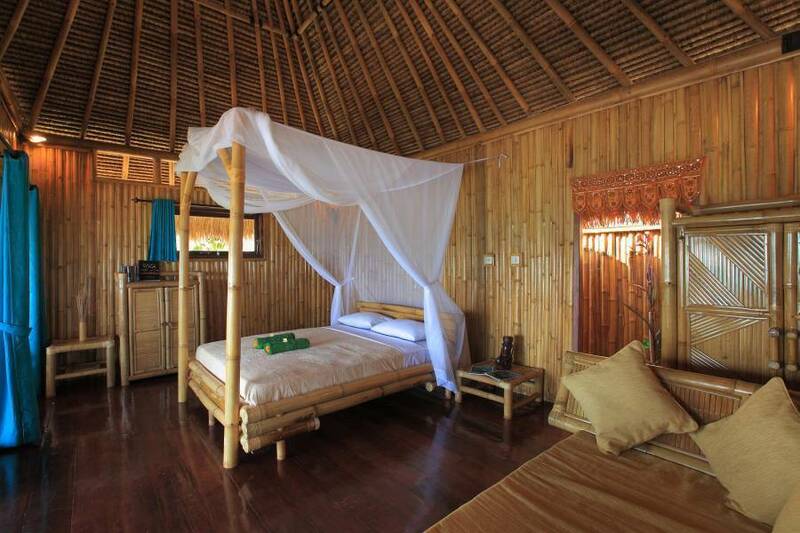 Take a deep breath, and relax at Rinjani Beach Eco Resort. Honey Moon Villa Our beach front "honeymoon" villas are the ideal place to relax. The spacious rooms feature a large double bed with mosquito net, fan and a well designed indoor/outdoor bathroom with hot water. Floor to ceiling windows bring the amazing view straight to you and you can relax on your own terrace, complete with hammock. Backpacker Bungalows You can still be comfortable even when travelling on a budget when you stay in one of our backpacker bungalows. Twin beds, mosquito net and a fan ensure a good night sleep. The large private indoor/outdoor bathroom has a cold water shower and you can enjoy a drink on the comfortable terrace.